Scots is sometimes said to have both unemphatic forms and emphatic forms of personal pronouns, though actual use is inconsistent. The emphatic forms are given in [square brackets] in the text below and usually correspond to the English equivalent. This is a useful distinction. 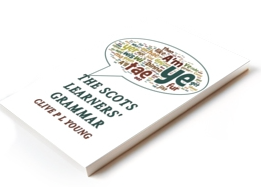 A telt ye, I telt ye, A telt you and I telt you all have different emphases which would be expressed in English by stress if spoken or putting in italics/bold if written. The concept that English-like linguistic forms are more assertive or emphatic is an interesting theme and you often hear Scots speakers code switch into English for effect e.g. A told you tae dae it. The ‘I’ form seems to cause problems in orthography. Scots pronounce it A, Ah (a bit longer), Eh (distinctive of Dundee) as well as Ay (the usual English way). Personally I write A, leaving Ah and I for emphasis. Whit’re yez daein the nicht? What are you (all) doing tonight? An informal American English equivalent would be ‘y’all’ or ‘you guys’. Further emphasis can be provided by you(se) yins. Nowadays Scots, like English, largely lacks a familiar form of you, but tou [thou] survived on the mainland until this century, but is now only used in Orkney (thoo) and Shetland (du) with the verb in the s/he form. Note that when combining A with another pronouns, the object forms are used and the I equivalent is usually placed first.. A’m no comin but Me an her isna comin (She and I are not coming). When using it with subject pronouns, order is different from standard English e.g. Gie hir it (Give it to her), Did ye tell him it (Did you tell it to him?). The pronoun often appears in an elided (short) form; Gie’s it (give it to me), By ma wey o’t (In my opinion), He tellt hir’t (He told it to her). There is no Scots equivalent to the English neutral pronoun ‘one’, and in Scots neutrality is represented by ye or they. thaim [thaim] (but the unstressed form is usually pronounced thum). Note Is that you? Ay, that’s me means ‘Are you ready/finished ? Yes I’m ready’. See can be used to emphasise any object pronoun; See him, he’s a daftie, See us, we’re brilliant. Thus thon buik’s mines, it’s no yours. My, your etc is in the adjectives section. For emphasis use my ane(s), your ane(s) etc. The plurals alternatively take -s ie wirsels. Me and ye can replace masel and yersel. Itsel is the equivalent of ‘by itself’. In speech this is contracted to that’s for all pronouns. Wha is normally only used as part of a question, so Burns’ Scots wha hae is stirring but nowadays ungrammatical! Scots that haes is the modern form. The interrogative pronouns are all different in form from English, but used similarly to their equivalents. Whase is is often replaced by wha belangs. Wha belangs thon hoose? Whose house is that? As we have seen above when English ‘whose’ is a relative pronoun, it is that plus a possessive. Whit wey noo? .Which way now? Whit for no? Why not? Whit a fowk! What a lot of people! Whit age are ye? How old are you? Whit wecht is it? How heavy is it? Eh, ye’v got a new bike? Do you have a new bike? A distinctive feature of the North- East dialect of Scots is that the wh sound is replaced by f (so foo, fa, fit etc Fit like? is ‘How are you?’). There are several other dialectical variants for example what (to rhyme with ‘cat) instead if whit. These usually operate in a similar positive/negative way to English; He’s no gaun, is he? He’s on the buroo, is he no? (with rising intonation). Compare to the English-like form He’s on the buroo, i(s)n’t he? (with falling intonation). A neutral tag Eh? which can be either positive or negative is also very common He’s on the buroo, eh? and He isna on the buroo, eh? A negative tag eh no? can also be used here. There is an analogy with a very similar informal positive tag hè common in Flemish/Dutch. The colloquial urban Glasgow tag int (isn’t) as in It’s awfie faur int it? is thought to be a fairly recent innovation or perhaps import. English ‘one’ could be ane (often pronounced ‘an’) but is more characteristically a bodie e.g. Gin a bodie meet a bodie. Also ‘ilkane or ilka ane (each one), onie ither bodie (anyone else), nae ithir bodie (no one else). Yin is also a common way of expressing the English ‘one’ in West Central dialects; the big yin, thon yins, yin thing aifter anithir. As in English ye is an impersonal pronoun: ye niver can tell.